Maker of high quality microscope slides of thinly sectioned minerals and other hard materials. Skilled producer of optical instruments. Son and apprentice of the respected microscope maker Moritz Hensoldt. Member of the Quekett Microscopical Club. School teacher in Texas. “Professor” of minerals at Columbia College, New York. Member of the New York Microscopical Society. Famous author. Well-paid lecturer. Fraud. Confidence man. Bigamist several times over. Thief. Fugitive from justice. Quack physician. Suspected enemy spy. Heinrich Hensoldt was all of these. What began as simple curiosity about the life of the man who was John E. Ady’s partner in the “Morphological Laboratory” slide-making enterprise, has revealed a man who assumed many, often dubious, characters. An abridged version of Hensoldt’s remarkable history appeared in the Quekett Journal of Microscopy, 2013 [1a], and is presented here in full to provide further insight into Hensoldt’s amazing life. Some revisions have been made, due to new information provided by Christine Belz-Hensoldt, a grand child of Karl Hensoldt (Heinrich’s younger brother). Figure 1. Left: Heinrich Hensoldt and autograph, ca. 1893, published in The Arena. 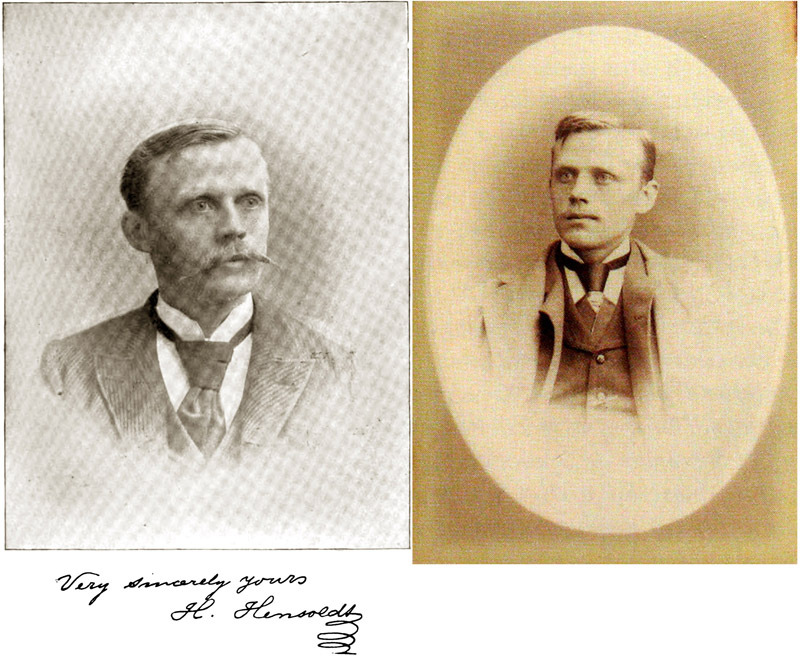 Right: Undated photograph of Heinrich Hensoldt, courtesy of Kathy DeFay . Moritz Hensoldt (1821-1903) was a well-regarded maker of microscopes and other optical instruments, establishing his own company in Wetzlar, Germany in 1877 (Figure 2). Sons Waldemar and Karl became partners in 1896, forming “Hensoldt and Sons”. It was to those two sons that Moritz left the business upon his death . Figure 2. Moritz Hensoldt, later in life. Another son, Heinrich, the subject of this article, was born September 10, 1856, in Oberlind, Thüringen. Heinrich’s name was occasionally anglicized to “Henry” in English and U.S. records. Numerous historical overlaps confirm that records of Heinrich and Henry Hensoldt refer to the same man. The family moved to Braunfels, near Wetzlar, in June of 1861, where Moritz established an optical works with Louis Engelbert. Biographies of Moritz note that Heinrich served an apprenticeship with his father. Heinrich claimed to have studied at the University of Giessen during the mid-1870s. To the Quekett Microscopical Club (QMC) in 1882, Hensoldt wrote, "My experience in meteorites before I knew of the specimen from Braunfels has at least been a practical one. Dr. O. Buchner of Giessen, who is the author of two works on meteorites, often sent small fragments from authenticated meteorites to my father for the purpose of obtaining sections from them. These mostly passed through my hands, and I was also, while studying at Giessen for one and a half years, a pupil of Dr. Buchner" . Hensoldt’s 1889 Naturalist's Rambles in Ceylon began, "About fourteen years ago, it was in October, 1875, when I was a student at Giessen, a small but well-known university town in Germany" . Otto Buchner really was a renowned expert in meteorites, and a faculty member at the University of Giessen. However, the QMC letter of 1882 demonstrates that Heinrich had long been able tell a lie whenever it suited his interests. Hensoldt family records indicate that Heinrich never studied at Giessen. Instead, during that time, he worked at the Wetzlar Post Office. Letters from Heinrich to his family, now in posession of his great-great-grandniece, Christine Benz-Hensoldt, indicate that he took a trip to the Indian subcontinent during the summer of 1875, and returned two years later. During the 1890s, Heinrich took on the mantle of professional writer and lecturer on India and Eastern philosophies, making numerous exaggerated claims concerning his earlier life. He wrote and spoke of having travelled through India, Nepal, and other regions for as many as 11 years during the 1870s and 1880s. However, he was definitely living in England by 1877, and his whereabouts for the next decade are firmly established and none of these refer to the Indian subcontinent. There are numerous other inconsistencies in Hensoldt’s claims of travels to India, and plenty of evidence to suggest he invented many of his tales, or plagiarised other’s work. However, his earliest stories took place only in Ceylon and were largely descriptions of the island, and there is evidence that he visited that island [3, 4]. The German language version of Naturalist's Rambles in Ceylon is Zwei Jahre in Ceylon (two years in Ceylon) . This is consistent with letters from Heinrich to his family and other records. He sent them a letter from the Suez Canal, Egypt, on August 14, 1875, while on the way east. Additional letters were sent from Kandy, Ceylon, on November 14, 1875, and from Calcutta (Kolkata), India, on March 25, 1877. He returned home later that year. Those experiences were obvious even to his detractors. Many years in the future, an ex-colleague, James F. Kemp of Columbia College, gave unwitting credence to Hensoldt’s Ceylon tales. Even though Kemp wrote “various unkind things” about Hensoldt, he also wrote that “he regards (Hensoldt’s) romances (except those regarding Ceylon) as pure fiction” . Another critic, Alexander Fullerton of The Theosophical Society, decried Hensoldt as “grossly ignorant of the subjects he writes about”, yet still believed Hensoldt had lived in Ceylon from 1875 to 1877 . Family letters indicate that Heinrich was in England during 1877. He was working with the Army on tests of optical equipment, on behalf of his father’s company. On June 12, 1880, “Henry Hensoldt, of Forston Street, in the county of Middlesex” was awarded an English patent for inventing "improvements in instruments for ascertaining distances, chiefly designed as range-finders for military purposes" . Heinrich remained in England, probably as the English agent for the family business. An 1884 reference to Hensoldt thin-section mineral slides indicated that the supplier was based in both London and Germany . The Quekett Journal of Microscopy reported in 1884 that, “Mr. Karop exhibited and described a very simple and ingenious gauge made by H. Hensoldt for measuring the thickness of cover glasses. It was graduated to measure from 0 up to 1/2 mm” . This may have been Heinrich’s own design, or an import from Wetzlar. Not everyone was impressed, as “Mr. Hailes said that the gauge shown by Mr. Hensoldt was the ordinary gauge used for measuring pianoforte wire” . On August 16 of 1884, Henry Hensoldt, “optician”, of 35 Forston Street, London, married Prudence Henderson, of Old Brompton, Kent at the Hoxton Holy Trinity Church, Hackney . This appears to have been his first marriage. Prudence was not particularly well off – her father was a sergeant in the Army Engineers. Henry listed his father’s name as “Maurice Hensoldt”, also an “optician”. Henry/Heinrich’s occupation is consistent with him being a maker of optical instruments and/or supplies such as slides. 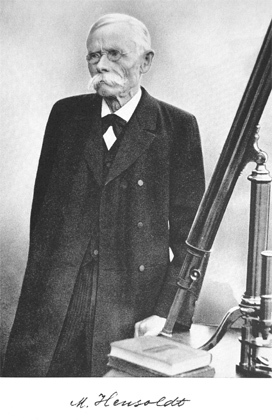 Heinrich was elected to membership of the Quekett Microscopical Club on September 23, 1881 . Over the next two years, Hensoldt exhibited several slides of thin-sectioned minerals and other hard substances . Based on his expertise in making thin-section mounts (Figure 3), these may all have been produced by Hensoldt. Figure 3. A microscope slide with Heinrich Hensoldt’s name, and others that were probably made by him. The handwriting on the labels is in English, indicating that these slides were produced specifically for the market in England. The handwriting on the mineralogical slides labelled “M. Hensoldt, Wetzlar” is very similar to that on the slide with Heinrich’s name, and with other slides that were made by Heinrich (see Figure 9), suggesting that Heinrich produced all of these slides for his father’s firm. Moritz was a skilled optician, so it is logical that he would have focused on instrument-making while allocating responsibility for slide-making to a skilled lapidary such as his son. Heinrich published requests for Echinus spines in 1882, and displayed “grouped sections of Echinus spines” to the Quekett Microscopical Club that same year. The cursive handwriting on the two illustrated Echinus spine slides is similar to the block printing on the mineralogical slides. The Watson & Son trade label on the lower righthand slide dates it to 1882 or earlier. Not everyone in his audience was impressed. Augustus De Souza Guimaraens presented a paper on November 24, arguing that his investigations of the Braunfels Meteorite indicated that the material was merely terrestrial quartzite . Hensoldt presented a rebuttal that same night, insisting that the material was truly a meteorite. He even provided the names of the shepherd who saw the meteorite fall, and the local student who presented the stone to Hensoldt’s father. Heinrich also published a letter in the April, 1883, Hardwicke’s Science-Gossip, continuing to argue that the Braunfels material was indeed meteoric and that the fluid in its cavities was extraterrestrial . Not surprisingly, Hensoldt offered prepared slides of the meteorite for sale and exchange (Figure 4). The February, 1883, issue of Hardwicke’s Science-Gossip included this exchange request: “Sections of the meteorite of Braunfels, containing fluid cavities with vacuoles in perpetual motion; well mounted. Will take in exchange scientific books.—H. Hensoldt, 7 Machell Road, Nunhead, London, S.E.” . Hardwicke’s Science-Gossip allowed for people to post brief, free ads in the “exchange” section. Hensoldt’s exchange request would have been both a legitimate exchange offer and a free advertisement to boost his sales. That ploy was exploited quite frequently by many professional slide makers. Thin section mounts of the Braunfels Meteorite were also offered by other retailers . Since all known fragments of the meteorite were in possession of Heinrich or his father , it is likely that these other slides were also made by Heinrich Hensoldt and the Hensoldt factory. Figure 4. 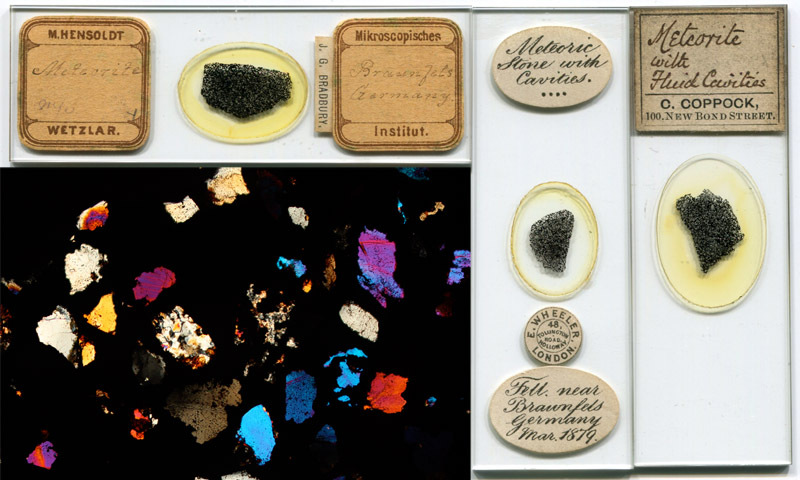 Thin section mounts of the Braunfels Meteorite, all of which were probably made by Heinrich Hensoldt. The handwriting on the slide labelled ‘M. Hensoldt’ resembles that of Heinrich Hensoldt (see Figure 3). The English spelling of ‘meteorite’ indicates that this slide was specifically intended for sale in England. A letter to Hardwicke’s Science-Gossip in May, 1883, stated that the writer had purchased such a slide from Edmund Wheeler in late 1882. 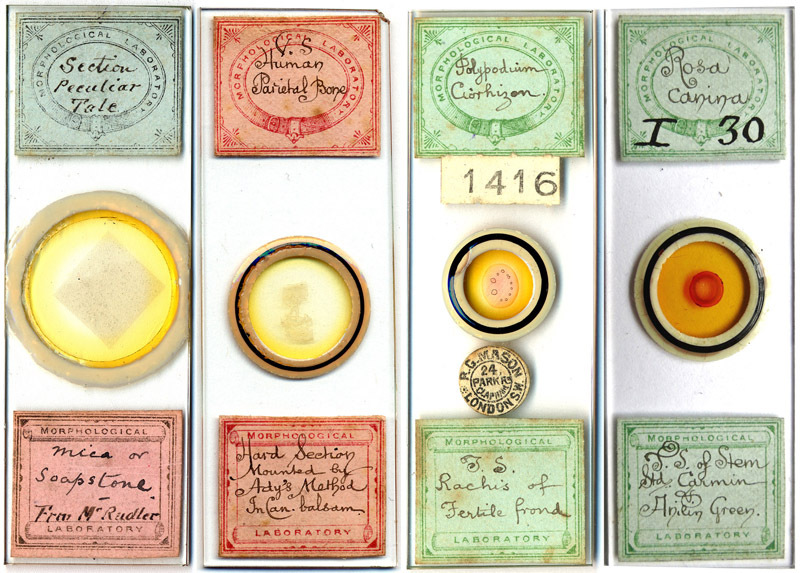 The slide with Charles Coppock’s labels supports the hypothesis that Hensoldt was one of Coppock’s suppliers of microscope slides (see below and Figure 5). The inset is a 10x magnification of the M. Hensoldt slide of Braunfels Meteorite, photographed with crossed polarizing filters. The small crystaline fragments are colorless under normal lighting, They are embedded in a black matrix. To the best of our knowledge, the origin of the Braunfels Meteorite remains uncertain. Hensoldt produced other thin sectioned mineral microscope slides. For example, the September, 1883, issue of Hardwicke’s Science-Gossip included this exchange offer, “Rock sections of unsurpassed excellence in exchange for interesting rock material - igneous preferred. - H. Hensoldt, Machell Road, Nunhead, S-E.” . Figure 3 illustrates a slide of arranged, transverse sections of echinoderm spines, labelled “M. Hensoldt” but written in English by a hand similar to Heinrich’s. These could well have been produced by Heinrich Hensoldt. He exhibited slides of “sections of various Echinus spines” and “grouped sections of Echinus spines” to the Quekett Microscopical Club during 1881 . In mid-1883, he posted an exchange offer in Hardwicke’s Science-Gossip, “Wanted, Echinus spines, British and foreign (not fossil). Will give in exchange well-mounted Echinus spine sections or other superior preparations. - H. Hensoldt, 7 Machell Road, Nunhead, London, S.E.”  Similar methods are used to prepare thin sections of both echinoderm spines and rocks . Charles Coppock was a partner of R. & J. Beck, resigning from that company in early 1883 to form his own optical business . 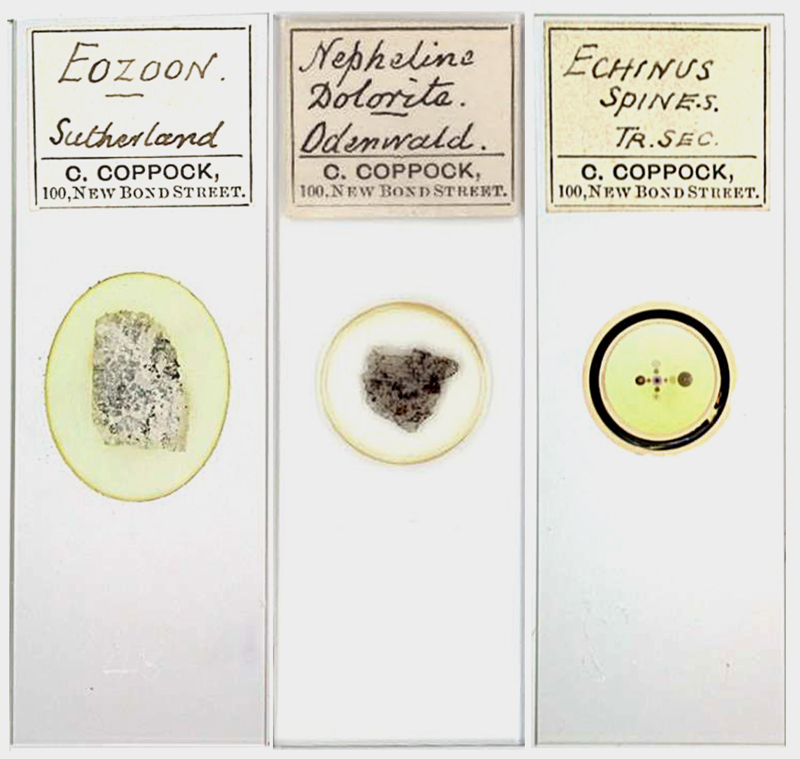 Coppock retailed a variety of microscope slides, including thin-sectioned rocks and echinus spines (Figure 5). The preparations bear strong similarities to those labelled “H. Hensoldt” or “M. Hensoldt”, suggesting that they were supplied by Heinrich. As illustrated in Figure 4, Coppock retailed slides of meteorite that were very similar to those of Hensoldt’s Braunfels meteorite preparations. In addition, the two Coppock-labelled slides shown in Figure 5, of Eoozoan from Sutherland and Nepheline Dolorite from Odenwald, were also produced by Heinrich Hensoldt as part of his Studies in Microscopical Petrography (see below). Figure 5. Microscope slides sold by Charles Coppock. The mounts bear strong physical resemblances to slides made by Heinrich Hensoldt. In 1883-1884, Hensoldt produced slides of eozoon from Sunderland and nepheline from Odenwald for his partnership with J.E. Ady. An additional Hensoldt/Coppock slide is shown in Figure 4, above. Late in 1883, Hensoldt and John Ernest Ady formed a partnership that they named “Morphological Laboratory” (Figure 6) [24, 25]. Aspects of the Ady-Hensoldt partnership have also been discussed in earlier publications by Steve Gill [24, 25]. Among their plans, the Morphological Laboratory would produce a collection work of “etched diagrams” and “specimens made by Hr. Hensoldt”. Significantly, this collection of drawings and microscope slides would be made available by “subscription, payable in advance.” In other words, Ady and Hensoldt collected their money in advance, with the promise that they would deliver at a later date. Figure 6. January, 1884 Hardwicke’s Science-Gossip advertisement from Hensoldt and J. Ernest Ady, for their new “Morphological Laboratory”. The given address, 7 Machell Road, was Hensoldt’s home. Figure 7. 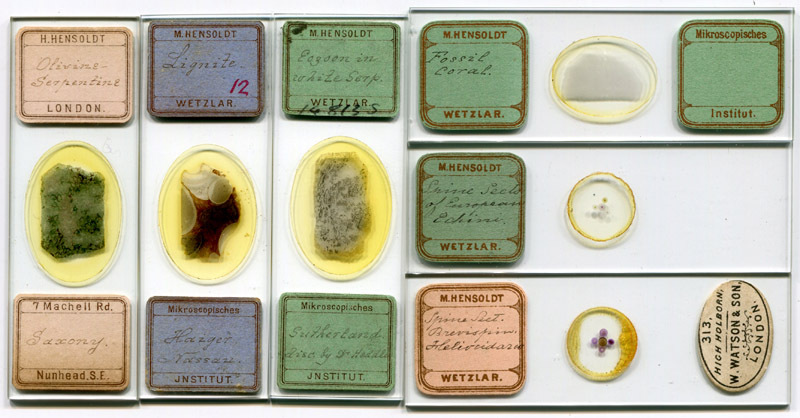 Microscope slides distributed by the Morphological Laboratory, the 1883-1884 partnership between Hensoldt and J.E. Ady. Hensoldt produced lapidary slides for the Morphological Laboratory until he left England ca. 1884, so he likely made the leftmost slide of talc/mica/soapstone. “Mr. Rudler” was probably geologist William F. Rudler . The other illustrated slides were probably made by Ady or Alfred Doherty. The January, 1884, issue of that magazine reported, “Microscopy Sample Slides.- We have received two of the slides prepared by Messrs. Ady & Hensoldt, as advertised in our columns. One of them is a double object, containing both a longitudinal and a transverse section of the compact tissue of the middle of shaft of the human humerus, mounted in gum and Canada balsam; and the other a section of the Eozoonal white Serpentine, recently discovered by Dr. Heddle in Sutherlandshire. These specimens approach the best style of mounting we have yet seen, and if the new Morphological Laboratory continues to send forth slides of this character it cannot fail soon to command general attention” . The human bone slide was advertised as a “sample slide” in the partnership’s January advertisement (Figure 6). The “Eozoonal white Serpentine” was also to be the first specimen provided to subscribers of Microscopical Petrography (see below). The journal Nature was also supportive of the project, writing on January 24, that "Studies in Micrographic Petrography. (Ady and Hensoldt, 7, Machell Road, Nunhead, S.E.) The growing interest taken in this country in the study of petrography is well shown by the rapidly increasing facilities offered for the prosecution of this branch of science. The most recent of these has just appeared under the foregoing title. It is to consist of the issue of two dozen microscopic slides of characteristic minerals and rocks prepared by Mr. Hensoldt of Wetzlar, with illustrative drawings and descriptive text by Mr. J.E. Ady, who is already favourably known for his microscopic preparations of British rocks. The first number of the ‘Studies’ is devoted to ‘Eozoon, Led Beg, Sutherland’. It contains two lithographic plates illustrative of the so-called eozoonal structure of a limestone in the north of Scotland, and four pages of descriptive text. The author gives a brief reference to the literature of the subject, and an account of the microscopic structure of some portions of the limestone in question, which he regards as akin to that of the Canadian Eozoon, but as being of inorganic origin. We are afraid his sketch is too slight to have much weight in the controversy regarding Eozoon. His effort to extend the opportunities of petrographical investigation, however, and to popularise this fascinating but difficult branch of geology is praiseworthy, and we hope that his ‘Studies’ may meet with such success as may induce him to continue them” . Hardwicke’s Science-Gossip noted, "Petrographical Studies.- We have received No. 1 of Messrs. Ady & Hensoldt's new publication bearing the above title. It deals with the specimen of Calciferous Serpentine sent out as a slide, to which reference was made in our last number, commonly called eozoonal. A brief, but exceedingly clear abstract is given of the opinions of Carpenter and others as to the organic character of Eozoon, on the one hand, and of Mobius on the other. The Sutherlandshire Eozoon lends considerable evidence to the mineralogical theory of Professors King, Rowney, and Mobius. The sketches accompanying the part are very carefully drawn and executed” . The February issue also included two advertisements from The Morphological Laboratory, providing more details on the subscription series and an apparently novel type of microscopical cabinet (Figure 8). The advertisement listed several prominent names who had already paid their subscriptions. Due to high levels of interest in the series, arrangements had been made by the Directors to increase the number of sets from 100 to 150 . 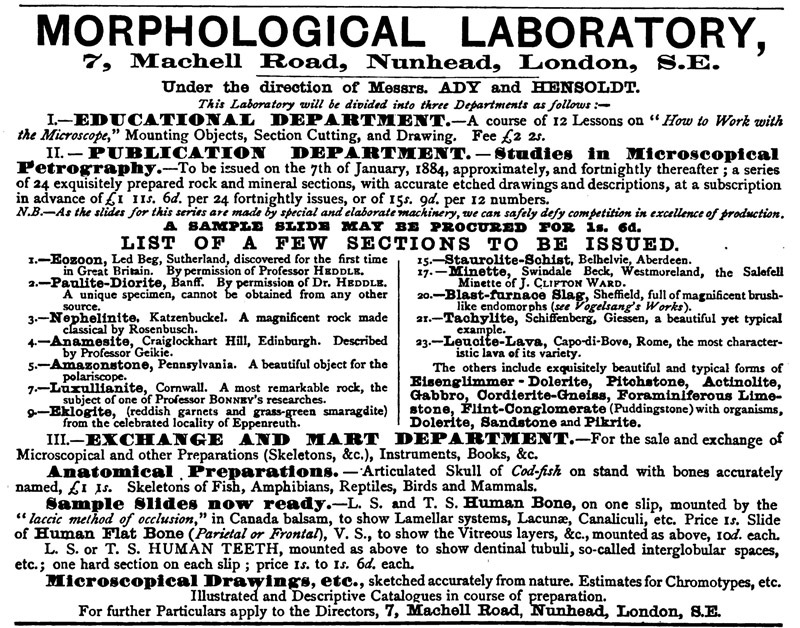 The advertisement mentioned that The Morphological Laboratory would also provide “double-stained plant sections in great variety” and “sections to show fructification of Lichens, and other cryptograms”. At this same time, Ady formed a partnership with Manchester slide-maker Alfred J. Doherty, and, beginning in March, began a series similar to the petrographical series. Doherty was renowned for his double-stained botanical section slides. One of the first specimens he provided to the Ady and Doherty series was of the lichen Physcia stellaris. Thus, it is likely that the botanical slides offered by Ady and Hensoldt were produced by Doherty [24, 30]. Figure 8. 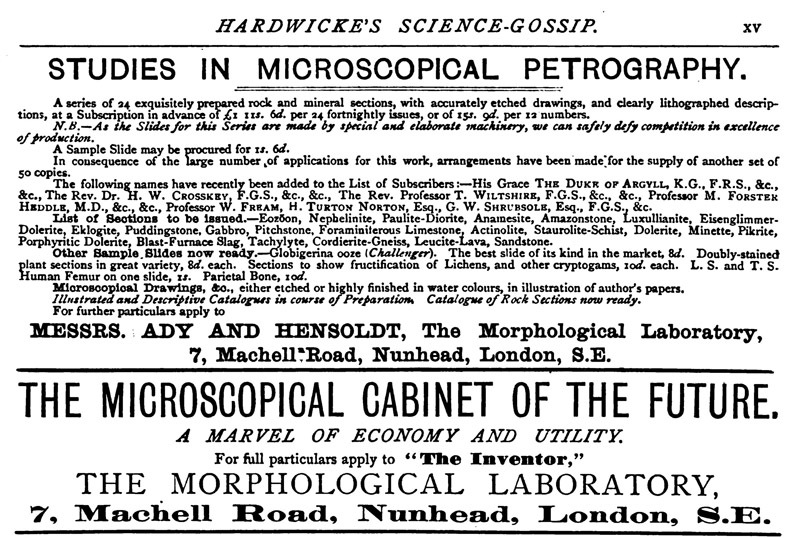 Advertisements from Hensoldt and Ady’s business, February, 1884 issue of Hardwicke’s Science-Gossip. The structure of Hensoldt’s ‘Cabinet of the Future’ is not known. March, 1884: “Petrographical Studies.- We have received two exquisitely prepared slides illustrative of this series, now being issued by Messrs. Ady & Hensoldt. One is a section of Nephelinite, from the Odenwald, perhaps the most remarkable of all volcanic rocks, for its beautiful appearance under the polariscope. The other is a section of Amazon stone (a green feldspar) from America. Both slides are accompanied by terse, but accurately written, descriptions. A new and valuable feature in this work is the series of hand-tinted plates illustrating the essays, which enable a student easily to verify the various mineral constituents of each specimen”. July, 1884: “Mr. J.E. Ady writes to say that owing to certain differences betwixt himself and his colleague, Mr. Hensoldt (which we cannot enter into here), he begs the indulgence of the subscribers until suitable arrangements can be made for continuing the Petrological Studies." August, 1884: “Mr. A.J. Doherty requests us to inform our readers that he has withdrawn from his connection with Mr. J.E. Ady, and that none of the slides accompanying the ‘Popular Studies in Comparative Histology’, with the exception of the sections of Physcia stellaris and Rosa canina, will be prepared by him”. The magazine made no specific mention of the Petrological Series after that. However, the February, 1885, Hardwicke’s Science-Gossip noted that Ady was providing what may have been substitutes for the mineral slides, “We have received from Mr. J. E. Ady, an additional issue of his able papers, entitled ‘Deep Sea Soundings,’ illustrated. Mr. Ady also offers what he calls ‘Optional Slides’ to his subscribers” . If the Hardwicke’s Science-Gossip reports are a complete description, then Hensoldt provided only 7 of his 24 promised specimens. Whether Ady completely fulfilled the subscriptions is not clear, nor is it known whom he found to prepare the additional slides described in August, 1884. With over 100, possibly as many as 150, subscribers who pre-paid nearly £2 each, there may well have been a considerable number of angry customers in England. Rather suspiciously, ca. 1884, Heinrich Hensoldt moved to Cedar, Texas, U.S.A., a small, rural town [32-35]. That was about as far as possible one could move from London. Cedar had a large population of recent German immigrants, and Hensoldt taught their school. When Hensoldt applied for a new US passport in 1895, he testified that he arrived in the US on July 15, 1885 . Another passport application, in 1896, claimed an arrival date of June 30, 1886 . Hensoldt’s 1898 passport application stated that he had immigrated to the U.S.A in the spring of 1884 . He did, however, consistently report the same dates for his birthday, and for his US naturalization, which was November 11, 1891 [36-39]. He certainly moved to the USA in 1885 or earlier, since Heinrich and Prudence’s eldest daughter, Ella, was born in Cedar on November 29, 1885 [40-41]. A Bohemian immigrant to Texas, named Frank Raniosek, found an unusual boulder on his farm. Heinrich Hensoldt learned of the stone, recognized it to be a meteorite, and acquired it from Raniosek. Modern analyses of what became known as the Bluff Meteorite indicate that it is, indeed, extraterrestrial. At the time of its discovery, the meteorite weighed between 280 and 320 pounds. In January, 1888, Hensoldt sold the Bluff Meteorite to Ward’s Natural Science, which in turn sold pieces to various customers [32, 34, 35]. Quite likely, this find provided Hensoldt with a good deal of money and scientific exposure. The 1888 International Scientists' Directory listed, “Hensoldt, H., Cedar, Fayette Co., Texas. Specialty, Microscopic investigation of Rocks and Minerals” . In October, 1888, Heinrich obtained a position on the faculty of the Columbia College School of Mines, in New York City. The 1888-89 Annual Report of Columbia College indicated that “the appointment of C. B. Laraway as Assistant in Natural History was discontinued from October 1st, and Dr. H. Hensoldt was appointed to the position thus vacated, to hold office for one year”, and the Columbia register listed him as “H. Hensoldt, Ph.D.” [42, 43]. From that time onwards, Hensoldt referred to himself as “Doctor” and “Ph.D.” The 1911 book Reality of Matter, which was critical of Hensoldt, implied that Hensoldt claimed an education at Syracuse University . Since all of Hensoldt’s time from 1880 onward can be accounted for, it is not possible that he attended Syracuse for any length of time, if at all. We note also that, prior to his position at Columbia, there was no mention of Hensoldt earning a Ph.D. It is almost certain that he fabricated his educational record. Possibly in conjunction with interviewing at Columbia, Hensoldt presented a talk on “The Microscopical Investigation of Rocks, A Plea for the Study of Petrology”, to the New York Microscopical Society in April, 1888 . He also exhibited 6 of his slides of thin-sectioned minerals, and “by means of specially devised apparatus, exhibited before the Society the operations of slicing, grinding and polishing minerals, and explained his methods of mounting thin mineral sections” . He was elected to membership of the New York Microscopical Society in April, 1889 . During his time in New York, Hensoldt gave numerous lectures to scientific societies, and published several works on geology [4, 48-58]. Hensoldt also masterfully mounted many types of biological specimens (Figure 9). He also provided the microscope slides used for photographs that accompanied a children’s story called “My microscope” . Figure 9. 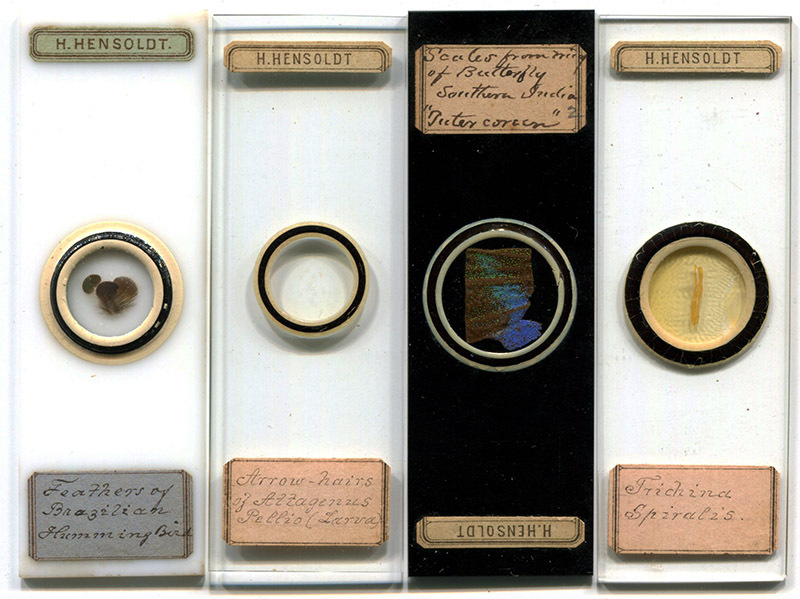 Four microscope slides of biological specimens that were made by Heinrich Hensoldt. These were obtained in a cabinet of slides from a Victorian member of the New York Microscopical Society, and probably date to Hensoldt’s time in that city. The hummingbird feathers are mounted on opaque white glass, and the butterfly wing is mounted on opaque black glass. The 1888 move was not Hensoldt’s first trip to New York. The minutes of the October 25, 1886, meeting of the New York Academy of Sciences report, “Mr. H. Hensoldt, a visitor, stated that he had discovered in a meteorite, which lately fell at Braunfels, near Wetzlar, Germany, liquid carbonic acid in cavities in supposed quartz; and he discussed this and other facts concerning meteorites in their bearing upon the question of the earth's interior” . That information, combined with Hensoldt’s experience at his father’s optical works and his later reputation as a charlatan, suggest that he was probably the subject of a January, 1887, letter to the American Monthly Microscopical Journal, “To The Editor: Some time ago a German calling himself H. Hensoldt called on us, and offered us objectives with the name, etc., of Carl Zeiss, in Jena, pretending that they were the new apochromatic objectives, and that he was one of Mr. Zeiss' former workmen and knew all about these lenses. The low prices he offered them at, and the difference in workmanship (his being made in an inferior manner), induced us to inquire of Mr. Zeiss. The answer was that such a man was not known to him, nor did he ever get any objectives out of his place. Mr. Zeiss further requests us to do our best in counteracting the swindle of this person, and even to have him arrested if found out. We request you to give this information publicity in your Journal so as to warn your readers and the public from purchasing or believing in the assertions of this swindler. Fr. J. Emmerich & Son, 138 Fulton St., N.Y.” . Hensoldt was employed by Columbia from 1888 until 1891. College records give the Hensoldt’s address as 197 Hendrix Street, East New York [62-64]. Heinrich and Prudence’s second daughter, Florence Annie, was born there in 1890 . Figure 10. Photograph of Prudence, Ella, Florence and Heinrich Hensoldt. Judging from the girls’ apparent ages, the photograph was probably taken when Heinrich visited England in mid-1891. Courtesy of Kathy DeFay. Prudence then took the girls back to England, alone. The 1891 census of England, conducted on April 5, recorded them at the home of Prudence’s mother in Chatham, Kent . Meanwhile, on April 17, Heinrich displayed exhibits at the New York Microscopical Society’s Annual Reception . However, Heinrich appears to have made at least one trip to England in 1891, as a son, also named Heinrich, was born April 5, 1892 . Hensoldt was probably the Henry Hensoldt who arrived in New York on October 6, 1892, having sailed from Liverpool . The American Naturalist reported, in 1891, that “Dr. H. Hensoldt, curator of the Geological Museum and lecturer in Petrographical Philosophy at the School of Mines, Columbia College, New York, will shortly issue a work, ‘Studies in Microscopical Petrography’. It will consist of a series of one hundred mineral and rock sections for the microscope, with descriptions and accurate, artistic lithographed plates” . That would have been essentially the same as Hensoldt and Ady promised to English microscopists in 1884. There is no evidence that Hensoldt fulfilled this promised body of work, either. Hensoldt evidently turned away from his University colleagues after he was “retired” from Columbia on June 30, 1891 [63,64]. The 1892 School of Mines Quarterly included this from Lea McI. Luquer, “Several unsuccessful attempts have been made to obtain from Mr. Hensoldt the unfinished portion of his article on ‘Methods of Modern Petrography’, but there seems to be no prospect of ever getting from him the desired information. I have therefore decided, at the request of the editors, to put on record the methods used in the Mineralogical Laboratory of Columbia College, treating the subject in somewhat more detail than is generally done in text-books. At the same time I wish to state that Mr. Hensoldt is not responsible for anything contained in this article” . 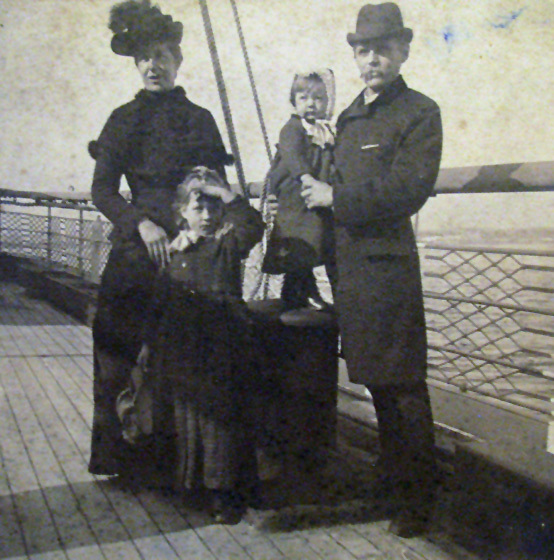 Prudence, Ella, Florence, and an infant son, Heinrich, returned to New York on October 7, 1893. They quickly sailed back to Southampton, arriving in England on November 8, 1893. Heinrich did not accompany them on either voyage [70,71]. By the time of that visit by Prudence and the children, Heinrich had established a second family. He married Augusta Chormann during either late 1892 or early 1893. A daughter, Johanna, was born in March, 1894 . There are no indications that Heinrich and Prudence were ever divorced. To the contrary, Prudence Hensoldt listed herself as being married on the 1911 English census . In addition to writing and speaking on geology during the late 1880s, Hensoldt began what was to be a lucrative career in describing his “travels” in India and on eastern philosophies. On March 20, 1889, he lectured to the Brooklyn Institute on “A Mineralogist in Ceylon” . That same year, Hensoldt published a “A Naturalist’s Rambles in Ceylon”, based on his trip to Ceylon in 1875 . His 1890 story, “The Naja-Kallu or Cobra Stone”, was set when Hensoldt was in Ceylon, in November, 1876 . As noted above, he visited the Indian subcontinent from 1875 until 1877. However, several events in his very first work were obviouly fictitious. For example, Hensoldt supposedly went to Ceylon with a fellow student named Dr. Ferdinand Goldschmied, a specialist in “oriental languages and the ancient civilization of the East”. Poor Goldschmied died of jungle fever shortly after their arrival . There are no records that Goldschmeid actual existed, and the character was undoubtedly based on Paul Goldschmidt, an expert in eastern languages and civilizations who went to Ceylon in 1875 and died there in 1877 . This theme of referring to those who were in no position to refute his claims was often repeated. Later essays by Hensoldt extended the duration of his travels to impossibility [76-80]. In his 1893 work, Among the Adepts of Serinagur, Hensoldt claimed that he, ”left Germany when still a youth, accompanying Dr. F. Goldschmied … and spend two years in that land of mystery, of which I could tell a tale. I afterwards travelled, as a naturalist, over the whole of India, then through a part of Thibet, Bhotan, and British Burmah, and, in 1883, from Rangoon to Mandalay, being at that period the first European who ventured alone through the wilds of the Irawaddy ... Of my subsequent travels in Madagascar, South Africa, and on this continent, I will only say that they enabled me to amass a store of knowledge which no amount of book study could have conferred . A journey to visit a wise man named “Coomra Sami” in Kashmir supposedly took place in March, 1881 . Hensoldt also wrote a pamphlet entitled Annie Besant, eine Wunderliche Heilige in 1906, claiming to have met the spiritualist Madame Blavatsky in India during 1883 [81,82]. Yet, Hensoldt was definitely living in England from 1877 until 1884, and in the U.S.A. from 1885 onward. Hensoldt’s 1894 Occult Science in Thibet included some truly remarkable fiction, such as, “The Dalai Lama's gaze was that of the adept of the highest order, and as I encountered those wonderful eyes, I knew and felt that I was in the presence of one who could read my innermost thoughts. He addressed me in my native German, and moreover in a dialect which I had not heard for many years and which he could not have acquired by any process known to ordinary mortals. This is all the more remarkable when it is considered that I had taken special precautions to conceal my nationality. Before leaving Darjeeling I went through an elaborate process of staining the greater part of my body, and, dressing in the customary garb of the hill population of northern India, I travelled as a Hindoo of rank ... The reader may well imagine that the Dalai's addressing me in provincial German filled me with amazement; for even if I had been suspected to be a white man, how could my closer nationality have been discovered, and how could the mysterious youth have acquired a knowledge of the German language, which was absolutely free from foreign accent, and moreover of a dialect which is limited to a small district of the fatherland?” . As time passed, Hensoldt’s claims of travel had become more expansive and lengthened in duration. The October 19, 1894 Washington Times reported that a lecture would be presented by “Dr. Heinrich Hensoldt, Formerly lecturer on Geology, Columbia College, NY. For eleven years a traveller in India and the East.” . Hensoldt made a fairly good living from his lectures. The Washington Times advertisement stated that reserved seats cost 25 or 50 cents, so a full house might have brought in $50 to $100, a considerable sum at the time . The December, 1894, issue of The Arena included a story by “Heinrich Hensoldt, Ph.D., the German Scientist, whose occult papers have been ‘The Hit’ of the year.” . The public appetite in the USA and abroad appears to have kept Hensoldt employed through much of the 1890s [6,85]. A critic, who recognized Hensoldt’s lies, nonetheless wrote, “it was all very interesting, and with few exceptions was scientifically and philosophically ‘true to the books’; and consequently nobody was seriously injured; the public was entertained and instructed; Mr. Hensoldt made himself a reputation and some easy money, and laid a fine foundation for a series of public lectures to follow, and for more money and a wider reputation.” . Another critic, who had a lunch meeting with Hensoldt in London during the spring of 1895, afterwards wrote, “the truth of this latest tale does not seem to be its most striking characteristic … I asked Dr. Hensoldt whether or not he was sure of his facts. He said that, in the main, he was quite sure they were correct, but he had written them up a little. After he had left, the Ceylon Observer came into my hands, from which it would seem that either Dr. Hensoldt has been sadly misinformed, or that his ideas as to what is permissible in writing up are very large … the story, which, although so circumstantially told, seems to have been an elaborate romance, built upon a very slender substratum of fact. I hope that Dr. Hensoldt is a little more careful as to the information he receives from his friends, or as to the liberty which he allows himself in writing up his Indian experiences than he has been in this story from Ceylon. Dr. Hensoldt has been lecturing throughout America. Wherever he went, he says, he had crowded audiences, and he was much pleased by the universal interest which his discourses upon Indian occultism had roused among the educated classes of the United States.” . A Chicago interviewer reported “on the whole Dr. Hensoldt does not seem to feel badly over the criticisms and says his enemies have well advertised him” . The Reality of Matter: A Critical Correspondence Between Heinrich Hensoldt, Ph.D. of Columbia University and a Member of The Order of the Brotherhood of India, published in 1911, compiled two 1890s articles by Hensoldt and letters by TK (the pen name of philosopher John Emmett Richardson). TK wrote a letter in response to Hensoldt’s Occult Science in Thibet, whereupon Hensoldt published a reply entitled A Plea for Pantheism . Hensoldt did not respond to the second letter by TK, written after A Plea for Pantheism. 1. That Mr. Hensoldt had never been in India. 2. That insofar as the article purported to be an autobiographical sketch, it was a fiction pure and simple. 3. That instead of going personally to India, and there meeting the alleged great Adept, ‘Coomra Sami’, and discussing with him the mysteries of Nature and of Life - as he had narrated with such a wealth of detail and interesting incident - he had only gone away into some quiet and safely obscure retreat, and there, with the aid of a vivid imagination and a few good books of ‘Travels in India’ and ‘Religions and Philosophies of the Orient’, had made ‘Coomra Sami’ out of the ‘dust of the Soul’, blown into him the ‘breath of his lively imagination’, pronounced him ‘good enough’, and proceeded to ‘learn’ from this brand-new, home-made ‘Adept’, all the wonderful things found in the books he had been reading about India, and some other things of his own make, without admixture with Truth”. Curiously enough, after my first article was written, there came to me one day through the mails, but truly as if it had dropped from the clouds, a carefully written letter, unsigned, bearing the postmark of an out-of-the-way village in the South, - telling me that Mr. Hensoldt had never been in India; that during the entire period covered by his alleged travels in the Orient he had been in the United States in the home of a personal friend of the writer of the letter; and that he had obtained all the important data for his entire series of Arena articles from the library of the party in whose home he had spent the time covered by his supposed ‘travels’, and from books he obtained from other libraries in the South. This mysterious letter contained much added information - or alleged information - concerning the past life and doings of Mr. Hensoldt, some of which was strangely verified soon thereafter, by educators in Columbia University, in Syracuse and elsewhere. As will be observed in my second article, it is ‘suggested that doubts have been expressed as to the existence of any such man as 'Coomra Sami' and that similar doubts have been expressed as to whether Mr. Hensoldt was ever really in India,’ etc., and that there might be some question as to his right to use the designation ‘Ph.D.’ as evidence of his collegiate standing. It is evident that Mr. Hensoldt knew from these gentle hints and reminders that he had been discovered, and that one more communication from his presumptuous critic might prove extremely embarrassing. At any rate he closed the controversy abruptly by failing to respond to my second article. I have to confess that he showed excellent judgment in thus depriving his critic of the opportunity to give to the public a much more definite and lucid statement and exposition of the subject. “It is a decade and a half since I first read in The Arena, of Boston, the Hensoldt articles, beginning in December 1893 and ending with ‘A Plea for Pantheism’ in the April number, 1895. I was at first both amazed and delighted that a German ‘Doctor of Philosophy’ could be so hospitable toward ‘Hindoo Magic’, the ‘Adepts of Serinagur’ and the ‘Secret Doctrine of the Brahmins’. ‘The Fate of Major Rogers’, rather staggered my credulity, but in view of the claim of a number of years and extensive travels devoted to the exploration of mountain fastnesses and study with Indian Sages, I withheld judgment. So also with some of the experiences recorded with ‘Coomra Sami’, in demonstration of the familiar slogans ‘Matter is Maya’, ‘Beware of the Illusions of Matter’, etc. While the series of papers was running in The Arena, I think in the winter of 1894, I wrote to Dr. Hensoldt - in care of The Arena - for his terms for a lecture in Cincinnati. On receiving reply I accepted his terms naming a date over two weeks distant, and offered the hospitality of my home for the occasion. Within three days, (to my surprise) he arrived in Cincinnati and came at once to my home, and was my guest for two weeks. I had anticipated the opportunity for conversation and much information of the Eastern world and its teachers during his visit, but every day of his sojourn he spent in his room with closed doors, evidently busy in writing. Among a lot of my old books, I had a copy of Abbe Hue's ‘Journeys’, and ‘The Mission of George Bogle to Thibet’ and ‘The Journey of Thomas Manning to Lhassa’, published in London in 1879. On showing these books to Dr. Hensoldt he took possession of them during his visit, and I could not resist the suspicion that he was writing further 'Travels in the far East’. I secured him a fine audience for his public lecture which seemed quite common-place in view of his wonderful personal experiences, and the oft repeated statement in The Arena that none of these things was covered by the pledge of secrecy. Hospitality, however, made me conceal my disappointment. Following his public lecture he was invited by the ‘Pharmaceutical Society’ to give them a lecture on ‘The Adepts of India’ which he accepted. ‘Now’, I thought, ‘the oracle must speak’. The audience was composed largely of practical scientists, chemists and professors from the University of Cincinnati. Imagine, if you can, my amazement and chagrin, after briefly introducing him as the author of The Arena articles, and naming his subject as proposed and accepted by him – ‘The Adepts of India’ - when without a word of explanation he proceeded to give a lecture on ‘Meteors’. Ironically, Hensoldt wrote a foreword for John Kersey’s Ethics of Literature, in 1894 . The Kersey book gave Hensoldt’s address as New Jersey . The 1895 census of New Jersey located Heinrich, Augusta, daughter Johanna, and Augusta’s mother in rural Oxford Township, Warren County . Being married to Prudence and Augusta did not prevent Hensoldt from taking a third wife. On October 18, 1895, he married Antonie (Antoinette) Schulze in El Paso County, Colorado . Hensoldt then took $5000 from Antonie, and disappeared. She later divorced him on grounds of desertion [91,92]. After only 3 weeks of marriage to Antonie, Hensoldt was in New York City on November 8, 1895, applying for a passport. He was next recorded applying for a passport in November, 1896 in Zurich, Switzerland, when he declared that his home was in Boston, Massachusetts and his wife was Augusta . The 1900 U.S. census reported Heinrich, Augusta, daughter Johanna, and Augusta’s sister, Marie Chormann, living in Scottsdale, Virginia . There is good reason to believe that the three moved to England soon afterwards. The 1907 Post Office London County Suburbs Directory registered “Hensoldt, Heinrich, Ph.D., 112 Ladywell Road, Lewisham, S.E.” . As discussed in detail below, a family that was almost certainly Heinrich, Augusta and Johanna Hensoldt sailed from England to the U.S. in October, 1908. They gave their former address as Richmond, England, which is about 15 miles from Lewisham . Figure 11. 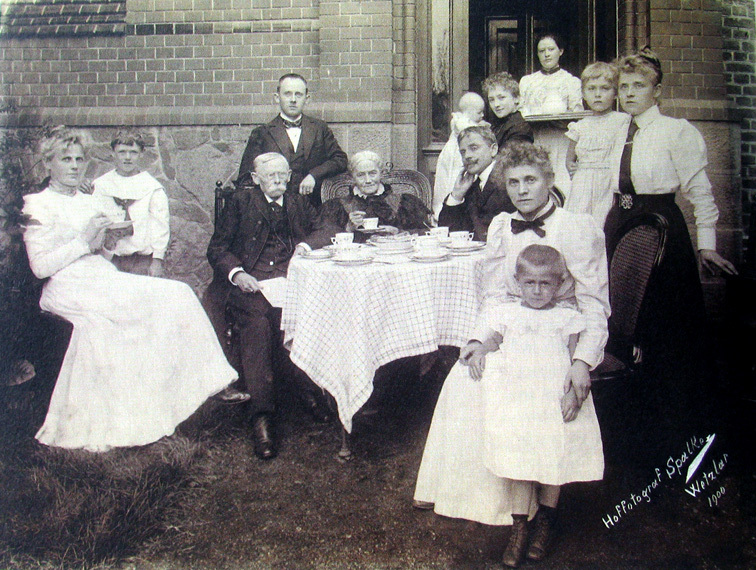 The Hensoldt family in Wetzlar, 1900. The source of the image, Heinrich Hensoldt’s great-granddaughter-in-law, Kathy DeFay, thought that it included Heinrich, but that has since turned out to be incorrect. Neither Heinrich nor any member of his immediate family was present. Seated at the table, left to right, are father Moritz, mother Christine, and brother Waldemar (head resting on hand). Heinrich’s other brother, Karl, stands behind their parents. Courtesy of Kathy DeFay. Hensoldt was living in Sydney, Australia by 1905 . Neither Augusta nor Johanna were with him. In March, 1907, Hensoldt began publishing a monthly magazine called Orient and Occident: a Monthly Magazine Devoted to the Investigation of Supernormal Phenomena, Popular Delusions, Organised Superstitions Conventional Shams, and the Social, Political and Moral Problems of the Day [96-98]. The Theosophical Quarterly wrote, in 1908, “Breaking the Fetters; or, The Truth About the ‘Church’, is a pamphlet by Dr. Henry Hensoldt, published by the author at Sydney, Australia. Dr. Hensoldt must be the same gentleman who formerly lectured about Thibet and the experiences which he wished he had had there. In this pamphlet he attacks the church, and for fear that he should be accused of partiality, explains that ‘whether against his unsavoury 'Saintliness' the Metropolitan of Moscow, who presides over the Holy (and greasy) Russian Synod, the astute charlatan who masquerades as Archbishop of Canterbury, or the amusing old trickster in the Vatican’, he has ‘the same respect for all, viz., absolutely none,’ which, we trust, is enough said.” . There are no indications that Heinrich divorced either Prudence or Augusta. Yet, on January 15, 1908, Heinrich Hensoldt took another wife, Ada Florence Wythes (wife number 4, at least, with only one divorce). Ada was the daughter of Thomas Wythes (died 1897), who had been a wealthy citizen and Mayor of Hillend, Australia [100-104]. After selling Ada’s land-holdings in Australia, the newlyweds took a honeymoon trip to the U.S.A.
“The honeymoon of Mrs. Ida (sic) Florence Wythes-Hensoldt and her husband, Dr. Henry Hensoldt, author, editor, and formerly lecturer in Columbia university, came to an abrupt end in Chicago … The dreams of a villa on the broad plains of Texas, surrounded by the cattle of a thousand hills, of intellectual soul communion beneath broad verandas, all have vanished. Mrs. Hensoldt, after three weeks of suspense, wondering what has become of her husband and money, sought the office of Capt. P.D. O’Brien of the city detective bureau yesterday. Amid sobs she poured out the story of those three terrible weeks, and told how her husband disappeared on Feb. 21 … ‘I am sure something has befallen him or he would write to me’, said the bewildered bride. ‘I gave him all my money for safe keeping. He left me such a loving note. We had decided to buy a ranch near Austin, Tex., and live happily, studying, and reading and pursuing intellectual pursuits at our leisure’ … The couple were married in Sydney, Australia on Jan. 15, after a typical soul mating romance. The professor, who has traveled around the world several times and lived nine years in India, also was editor of an occult magazine in Sydney … Dr. Hensoldt told his bride he received $350 a month income from his father’s estate in Coburg, Germany. The professor seemed to be a little hazy about his family ties. Mrs. Hensoldt has magazine articles and personal papers showing the professor was once on the faculty of Columbia university, and that he has received decorations from the magistrates of Germany, Italy, Turkey, and France as tributes to his lectures and articles on various subjects.” Chicago Tribune, March 14, 1908 . Figure 12. Newspaper headlines relating the 1908 Hensoldt desertion. Clockwise, from top left, Chicago Tribune, Fort Wayne (Indiana) Sentinel, San Francisco Chronicle, Auburn (New York) Democrat, and Salt Lake Tribune. The Sentinel headline refers to a claim that Hensoldt could speak 35 different languages. Figure 13. Ada and Heinrich Hensoldt, ca. 1908, from the Chicago Tribune, March 13, 1908. Triggered by reports of the Ada scandal, Antonie Schulze came forward with the story of her marriage, fraud and abandonment by Hensoldt Subsequent (discussed above) . Additionally, Antonie said that “she learned after he left her, that he had formerly married a young woman at Fort Worth, Tex., whose name she did not know, and had secured her fortune”. Moreover, “Mrs. Henry Hensoldt No. 3 (was) now believed to be in Germany with her two-year-old daughter.” The woman in Texas may have been his first wife, Prudence, with whom he lived in that state from ca. 1884 until 1888, or, just a likely, an additional woman. The woman and child in Germany was probably Augusta and Johanna. Hensoldt’s notoriety brought forth additional charges of fraud. Chicagoan Daniel Baldwin was reported to have lost $2000 he invested with Hensoldt on a silver mine in Texas, during 1895 [91, 111]. Australian Edward Bailey travelled to Los Angeles in March, 1908, to meet Hensoldt, with whom he planned to develop a gold mining claim in Texas. Needless to say, Hensoldt never showed up. Bailey told the San Francisco Chronicle that Hensoldt “said that while still at the head of the geology department of the Columbia University he had become convinced from observations of the Colorado River in Texas, that it must flow through rich gold deposits. He said that he had devoted more than five years to searching for this gold, and finally one day, in a rocky gorge near Austin, Tex., found a deposit of alluvial gold so rich that, with his bare hands, was able to take out $250 worth of gold in half an hour.” Bailey had secured an option on the land, sold his Australian land holdings and personal property, then come to Los Angeles . Unlike those other events, the Wythes scandal was reported around the world, and police searched widely for Hensoldt. Chicago authorities charged Hensoldt with “wife abandonment” , and Ada promised that “if her errant husband is discovered she will come back from Australia to prosecute him”. . After his disappearance from Chicago, there is only one documentation of Heinrich Hensoldt under that name . Although that biography of the Hensoldt family reported that Heinrich died in 1914  there is conclusive proof that he was still alive in 1917. In 1948, Johanna Hensoldt took a 7-day cruise to Bermuda, giving her home address as 301 Tennessee Avenue, Washington, D.C. . A 1934 travel record for Augusta Hensoldt Boernsen gave that same address as her home . The 1937 Washington city directory recorded “Boerhnsen Augusta H. (wid Paul) r301 Tenn Av NE”, indicating that she was the widow of Paul Boehrnsen . The 1930 U.S.A. census recorded the inhabitants of 301 Tennessee Avenue, Washington, D.C. as Johanna H. Bornsen, age 36, born in New Jersey to German parents, and Augusta H. Bornsen, age 63, widow, born in Germany . The 1920 U.S.A. census listed the inhabitants of 301 Tennessee Avenue as Johanna L. Bornsen, age 25, born in New Jersey with mother born in Germany and father born in Norway (the significance of this last to soon be obvious); Augusta H. Bornsen, mother, age 53, widow, born in Germany; and Marie Chormann, aunt, age 65, born in Germany . Recall that Augusta Hensoldt’s maiden name was Chormann, and Marie lived with the Hensoldts at the time of the 1900 U.S. census . The 1910 U.S. census recorded the following household in Berwyn Heights, Prince George’s County, Maryland (adjacent to Washington): Paul Börnsen, head, age 52, born in Norway, self-employed civil engineer; Augusta Börnsen, wife, age 42, born in Switzerland; Johanna Börnsen, daughter, age 16, born in New Zealand; and Mary M. Chormann, sister in law, age 54, born in Switzerland . There are no records of Paul Börnsen or this family prior to 1910, even though their census records state that they had immigrated in 1895. The only logical conclusion is that the Börnsen family was actually the Hensoldts. Since Heinrich Hensoldt was a wanted felon, the name and history change is understandable, logical and chronologically plausible. It appears that Heinrich travelled to England after leaving Ada, to bring Augusta and Johanna back to the U.S. The October 29, 1908, arrival manifest of the ship Adriatic included a family destined for Washington, D.C.: Paul Bornsen, age 50 years 3 months (Heinrich Hensoldt was then 51 years 1 month old), born in Sweden; Ethel Bornsen, age 41 years 8 months (Augusta was approximately 42 at the time); and Agnes Bornsen, age 15 years 7 months (Johanna was 15 years 7 months at the time). “Ethel” and “Agnes” listed as the nearest relative their mother/grandmother “Mrs. Bornsen”, of Richmond, England . No “Bornsen” can be found in any English census of the area. The Hensoldts bought their home in Berwyn Heights in 1909, a historical home now known as the Graves-Keleher House. The purchase was made in Augusta’s name. While not quite of sheep ranch size, the Hensoldt/Bornsen property included 23 house lots at purchase, and they added 2 more lots shortly thereafter. The property was sold in 1915, and the family moved closer to downtown Washington, to 301 Tennessee Avenue. .
Not surprisingly, Heinrich adopted a new confidence scheme. In 1915, he self-published a 36-page pamphlet entitled Radium in the Light of Recent Discovery . At that time, people were very excited about the new discoveries of radioactivity, and its potential benefits. Hensoldt espoused his elixir of life, a discovery he called “Radio-Strontium”. He wrote, “Having, for almost a decade, devoted the greater part of his time to the study of Radio-action and its effects on a great variety of substances, the writer considers himself all the more competent to pronounce an opinion at this juncture .. It would be difficult, if not impossible, within the limits of a treatise chiefly intended for the cultured laity to give anything like a satisfactory account of experiments which have occupied the writer during the greater part of four years; thus no attempt will here be made to enter upon details … If regularly taken in minimal doses, it produces what may well be termed a rejuvenating effect upon the patient, as manifested in a variety of ways, of which the following are the most remarkable: The skin assumes a peculiar glossiness and transparency, the eyes become clear and lustrous, while sight and hearing are rendered more acute, and - where defective - materially improved. Faces pale and haggard appear as if transformed by enchantment, owing to a gradual relaxation of the facial muscles and a freer play of the capillaries, to the extent that even features shriveled, wizened or cadaverous acquire a look of softness and rotundity. Very remarkable also, and in its way unique, is the role played by Radio-Strontium as a promoter of hair-growth. Indeed the stimulus, here, is such that even baldness of long standing is forced to yield and - incredible as it may seem - gray or white hair resumes its original color, retaining it permanently thereafter, irrespective of the age of the party in question”. Figure 14. From The Washington Herald, April 6, 1917 . Note that, by this time, Hensoldt had awarded himself doctoral degrees in both philosophy and medicine. Hensoldt/Börnsen travelled throughout the U.S., giving lectures on “Radio-Strontium” [121-123]. These lectures included exhibitions of his valuable commodity, such as the “$500,000 worth of radium” displayed at an August, 1916 lecture    in San Diego, California . A man of contradictions, Hensoldt had earlier mocked such displays as being ridiculous exaggerations of radioactivity’s price . In addition, although he claimed in his book not have any financial involvement with radiation therapies, Hensoldt developed what appears to have been a lucrative business in “treating” patients with his concoction. The 1918 city directory of Washington recorded Paul Börnsen as being a physician . An eyewitness reported that Bornsen was “supposed to be a doctor using Radium for the cure of Rheumatism and kindred ailments, having a number of patients coming to his    house in large automobiles” . Another eyewitness stated that Hensoldt “had four or five vials filled with a solution which (Hensoldt) claimed to be Radium; that he left them in a window for a few minutes prior to taking them into a dark room where they gave forth some rays, but not a thousandth part the rays of real Radium … these phosphorescent chemicals had been left at the window to absorb light.” . Since he was practicing medicine without a license, Hensoldt’s medical practice was fairly secretive. That was probably the undoing of Hensoldt’s radium scam. Being a Germanic person who made frequent, secret trips was a good way to attract attention during World War I [125-134]. Other activities further raised suspicions: in August, 1916, “Dr. Paul Bornsen” was described as being an intimate friend of “Capt. Karl Offer of the German army … one of the most daring aviators in the service of the Kaiser” . At least three people reported Hensoldt’s suspicious activities to authorities, telling the FBI “He has had two assumed names that I know of. He hates Americans and despises all things English … In the last few months he has made trips to San Diego, Cal., Boston, New York, Hoboken, Baltimore, and Southern Coast and there seems to be much secrecy connected with all his experiments and trips. All these facts with other rumors and incidents seem to me in this crucial time to warrant an investigation.”,                        “All of (the Börnsens) have a foreign appearance and are supposed to be German. (Börnsen) makes several trips a day down town, always carrying a brief case with him, and has been known to be out of town on numerous occasions for short stay – d   estination unknown.”, “he is pro-German and a man without principle.”, and “He is an educated man trying to pass as a Norwegian and a relative of the poet Bjornson. He needs looking after, for he is not to be trusted”. Possibly in an attempt to demonstrate his innocence and that any aid he may have given the Germans was unwitting, Hensoldt claimed to have invented microphotography and microfilm and unknowingly sold his secret to Germany. Both of those technologies were developed long before Hensoldt “invented” them. The July 24, 1917 Washington Times reported. “The invention of a Washington scientist is being used by German spies as one of their most effective instruments in secretly transmitting messages from this country to Berlin, it was brought to light today. The invention is that of Dr. Paul Bornsen, of 301 Tennessee avenue northeast, which makes it possible to reduce a photograph five hundred times. By this method spies operating through channels intimately connected with confidential bureaus of the United States could send to Germany secret orders without fear of detection. The process is known as prismatic reduction. Dr. Bornsen says he discovered it in Hamburg in 1885. Agents of the imperial German government purchased it under fraudulent pretenses from Dr Bornsen and developed it for the use of spies. This is believed by Dr Bornsen to be one of the agencies by which important information concerning the operation of America’s military establishment has been transmitted to German military authorities. The process is so effective that a page of newspaper print can be reduced until illegible with an ordinary magnifying glass. This reduction easily escapes detection. An ordinary letter can be altered by this process until it looks smaller than the head of a pin. Under a powerful microscope this tiny object is restored to its normal size. In this way hundreds of innocent looking gray specks on letters or articles of clothing are smuggled to Berlin. A full sized map of the United States, of the various States, or of military fortifications or forts can be reduced to an insignificant dot. Under the powerful lens in Berlin the maps will be shown at full size, every line and feature standing out in bold relief. Dr. Bornsen today exhibited a sample of the work of the process of prismatic reduction. On a strip of glass a gray speck, as large as the head of a pin, was made under a microscope to resume its natural size. It was the front page of the Hamburg Nachrichten, September 10, 1885. It was on this date that the Washington scientist, who is a Scandinavian by birth, sold the invention to Frederick Haller, of Hamburg, for the pittance of $300. According to Dr Bornsen, Haller represented himself to be a mining engineer and wanted the process to test ores. A few weeks after selling the patent Dr Bornsen discovered that Haller was an agent of the German government.” . That newspaper interview, and an Augus                                           t 7, 1917 FBI report, are the last known records of Paul Börnsen or Heinrich Hensoldt. The Börnsens advertised to rent a “large front room” of their house in September, 1918, which may have been Heinrich’s former laboratory . The 19    19 city directory listed Johanna as the householder of 301 Tennessee Ave. , while the 1920 census recorded Johanna as the household head . That same census listed Augusta as being a widow. Figure 15. Modern views of the house at 301 Tennessee Avenue, on the northeast corner with C Street N.E. Eyewitness accounts indicate that Hensoldt’s laboratory included one of the upstairs windows, facing front. The third floor on the house next-door appears to be a recent addition. Ada Hensoldt sailed back to Australia after her abandonment, arriving in Sydney on May 20, 1908 . A 1913 advertisement in The Sydney Morning Herald announced that Ada Hensoldt was taking boarders, “with breakfast if desired.” . She died in 1951 . After leaving New York in 1892, Prudence Hensoldt lived with the Hensoldt family in Germany: son Heinrich died in Wetzlar on April 25, 1894 . She and the girls later lived with Prudence’s mother in Kent, England . Prudence later lived in Kenya. She died in 1927, while travelling to New York [142,143]. She was probably on her way to visit her daughter, Ella, who was then working as a nurse in the U.S.A [41,144]. Augusta Hensoldt continued to live in the Washington, D.C. area, dying some time after 1940 . Johanna also remained in Washington, working for the U.S. Navy and the Library of Congress as a translator. Not surprisingly, it appears that she never married. It is not known what happened to Heinrich Hensoldt after mid-1917. He may have died at that time, as implied by Augusta’s subsequent census records. He was then 61 years old. But it would have been a remarkable coincidence for Hensoldt to die at the same time that the FBI began to investigate him. More likely, Hensoldt adopted yet another identity and disappeared into obscurity, or perha                                         ps returned to the bosom of his family in Germany. We have been unable to locate a death record for either Paul Börnsen or Heinrich/Henry Hensoldt. Throughout much of Hensoldt’s life his philosophy seems to have been that people, in general     , are gullible and if he could take advantage of such gullibility, then he was very willing to do so. With the caveat that he had been swindled by Hensoldt, Edward Bailey believed that his former partner “has a dual personality … if (Hensoldt) is not a real Jekyll and Hyde then there never was one in the world. I can account for his strange conduct in no other way. I myself have seen a subtle change come over the doctor while speaking or working. The metamorphosis lasted only a few seconds sometimes, at others the change was noticeable for weeks. Since I became acquainted with him in Sydney three years ago, I have seen the man’s habits undergo a complete change. From a strictly retiring, abstemious, modest man of science and letters, he became a wine-bibber, a follower of women and erratic in many ways. But always there were periodic returns to his real and better nature, when he became completely absorbed in his work, seemed to forget that he had ever deserted the calm road of science for the primrose path, and when he amazed and astounded all who came in contact with him by his erudition, his philosophy and his truly wonderful intellectual development.” . Further insight may be seen in Hensoldt’s address on “Chasing After Phantoms” to the Washington Secular League on March 11, 1917 [146,147]. “Dr. Paul Bornsen declared that two of the greatest phantoms or illusions to which the generality of mankind are subject are those of optimism with respect to human existence and the reality of the objective universe ... ‘The idea that life in itself is a pleasure is a phantom. This idea is due to an erroneous system of education, the habit of teaching children that such happiness is in store for them. Happiness is only a temporary cessation of pain. Pain is the normal state of man.” Or, perhaps Hensoldt simply invented what his audience wanted to hear. We thank Heinrich Hensoldt’s great-granddaughter-in-law, Kathy DeFay, and his great-great-grandniece, Christine Benz-Hensoldt, for generously sharing family information and photographs, and Howard Lynk and Peter Paisley for helpful discussions. 1a. Stevenson, Brian, and Steve Gill (2013) The many lives of Heinrich Hensoldt (1856 – circa 1918), Moritz Hensoldt’s errant son, Quekett Journal of Microscopy, Vol. 42, pages 3-17. 1. Poerzag, Karsten (2001) Hensoldt: Geschichte Eines Optischen Werkes in Wetzlar, Porezag, Wetzlar. 2. Hensoldt, Heinrich (1882) Further notes on fluid cavities in meteorites, Journal of the Quekett Microscopical Club, series 2, Vol. 1, pp. 185-190. 3. Hensoldt, Heinrich (1889) A naturalist’s rambles in Ceylon, The American Naturalist, Vol. 23, pp. 690-707. 5. Hensoldt, Heinrich (1890) Zwei Jahre in Ceylon, Druck der Cherouny, New York. 6.Chicago Tribune (1894) Hensoldt tells of Thibet sight, December 4, p. 7. 7.New York Tribune (1894) Discrediting his professions, Nov. 15, p.3. 8.Commissioners of Patents’ Journal (1880) Patent to Henry Hensoldt, page 701. 9.The American Monthly Microscopical Journal (1884) “Mr. Woolman has recently received a series of mounted sections of rocks, which are probably as good as have been seen, if not even better than any heretofore placed upon the market. They are prepared by A. (sic) Hensoldt, London and Wetzlar, and compare favorably in price with those of inferior quality”, Vol. 5, p. 179. 10.Journal of the Quekett Microscopical Club (1884) Series 2, Vol. 2, pp. 56 and 204. 11. Marriage record of Henry Hensoldt and Prudence Henderson (1880) Hoxton Holy Trinity Parish records. 12.Journal of the Quekett Microscopical Club (1881) September 23 Ordinary Meeting, Series 2, Vol. 1, p. 39. 13.Journal of the Quekett Microscopical Club (1881) Series 2, Vol. 1, pp. 98, 231, 232, 247, 321. 14. Hensoldt, Heinrich (1882) On fluid cavities in meteorites, Journal of the Quekett Microscopical Club, series 2, Vol. 1, pp. 1-14. 15. De Souza Guimaraens, Augustus (1882) Remarks on a paper “On fluid cavities in meteorites” read by H. Hensoldt before the Quekett Microscopical Club on August 26, 1881, Journal of the Quekett Microscopical Club, series 2, Vol. 1, pp. 182-184. 16. Hensoldt, Heinrich (1881) Further notes on fluid cavities in meteorites, Journal of the Quekett Microscopical Club, series 2, Vol. 1, pp. 185-190. 17. Hensoldt, Heinrich (1883) Fluid cavities in meteorites, Hardwicke’s Science-Gossip, Vol. 19, p. 78. 18.Hardwicke’s Science-Gossip (1883) Exchange offer for Braunfels meteorite slides by Hensoldt, Vol. 19, p. 48. 19. “F.S.” (1883) Fluid cavities in meteorites, Hardwicke’s Science-Gossip, Vol. 19, p. 111. 20. Hardwicke’s Science-Gossip (1883) Exchange offer for rock sections by Hensoldt, Vol. 19, p. 216. 21. Hardwicke’s Science-Gossip (1882) Exchange offer for echinus spines by Hensoldt, Vol. 18, p. 144. 22. Modern Microscopy: A Handbook for Beginners: Combining I. The Microscope, and Instructions for its Use and II. Mic                                                                                                                            roscopic Objects: How Prepared and Mounted, 2nd edition, 1895, Balliére, Tindall and Cox, London, pages 154-155. 24. Gill, St       eve (2008) The Adye enigma, Quekett Journal of Microscopy, Vol. 40, pp. 685-694. 25. Gill, Steve (2009) The Ady(e) enigma - resolved, Quekett Journal of Microscopy, Vol. 41, pp. 121-131. 26. Hunt, Robert and Frederick William Rudler (1878) Talc, in Ure’s Dictionary of Arts, Manufactures, and Mines, Seventh edition, Longmans, Green and Co., London, p. 967. 27. Hardwicke’s Science-Gossip (1883) A new morphological institution, Vol. 19, pp. 276-277. 28. Hardwicke’s Science-Gossip (1884) Advertisements from the Morphological Laboratory, and editors’ notes of slides produced by the Morphological Laboratory, Vol. 20, January issue p. vii, February issue p. xv, and pp. 18, 41-42, 67, 90, 114-115, 162, 185. 29. Nature (1884) Studies in micrographic petrography, Vol. 29, p. 283. 31. Hardwicke’s Science-Gossip (1885) Editors’ note of slides supplied by J.E. Ady, Vol. 21, p. 63. 32. Whitfield, J.E. and G.P. Merrill (1888) The Fayette County, Texas, meteorite, The American Journal of Science, Vol. 136, pages 113-119. 33. The International Scientists’ Directory (1888) Entry number 1947: Hensoldt, H., Cedar, Fayette Co., Texas. Specialty, Microscopic investigation of Rocks and Minerals. Gen Mic C Ex, S.E. Cassino, Boston, p. 73. 34. Charlton, O.O. (1904) Note on the Mart and Bluff meteorites, Transactions of the Texas Academy of Science, Vol. 4, page 83. 35. Heinsohn, Carolyn (accessed 2013) Fayette County meteorites and tektites, Footprints of Fayette, http://www.fayettecountyhistory.org/footprints3.htm. 36. U.S. Passport application of Heinrich Hensoldt, New York, USA (1895) Birth Date: 10 Sep 1856, Birth Place: Weimar, Germany, Age: 39, Residence: Columbia College, New York, Passport Issue Date: November 8, 1895. 37. U.S. Passport application of Heinrich Hensoldt, Zurich, Switzerland (1896) Birth Date: 10 Sep 1856, Birth Place: Oberlind, Sax Meningen, Age: 40, Residence: Boston, Massachusetts, Passport Issue Date: November 30, 1896, Spouse Name: Augusta. 38. U.S. Passport application of Heinrich Hensoldt, New York, USA (1898) Birth Date: 10 Sep 1856, Birth Place: Germany, Age: 42, Residence: New York, Passport Issue Date: September 20. 1898. 39. U.S. Naturalization record of Heinrich Hensoldt (1891) November 11, Residence: 48 East 107th Street, New York City. 40. Census of England (1891) Chatham, Kent, household of Eliza Henderson. 43. Annual Register of the Officers and Students of Columbia College, 1888-1889 (1888) pp. xi and 24. 44. “TK” (1911) Reality of Matter: A Critical Correspondence Between Heinrich Hensoldt, Ph. D. of Columbia University and a Member of The Order of the Brotherhood of India, Indo-American Book Co., Chicago. 45. Hensoldt, H. (1888) The microscopical investigation of rocks, a plea for the study of petrology, Journal of the New York Microscopical Society, Vol. 4, pp. 139-144. 46. Journal of the New York Microscopical Society (1888) Meeting of April 20, Vol. 4, p. 166. 47. Journal of the New York Microscopical Society (1889) H. Hensoldt elected a Resident Member, Meeting of April 19, Vol. 5, p. 90. 49. Hensoldt, Heinrich (1888) The larva of Attagenus pellio, and its wonderful armor, Journal of the New York Microscopical Society, Vol. 5, pp. 34-38. 50. lang=EN-GB style='font-family:Arial;mso-ansi-language:EN-GB'>Hensoldt, H. (1888) Atomic worlds and their motions, Popular Science Monthly, Dec. pp. 183-192. 51. Hensoldt, H. (1889) Methods of Modern Petrography, School of Mines Quarterly, Vol. 10, pp. 211-218 and Vol. 11, pp. 29-36. 52. Hensoldt, H. (1889) Meteorites and what they teach us, The American Geologist, Vol. 4, pp. 28-38 and 73-84. 53. Hensoldt, H. (1891) Immortality in the light of modern dynamics, Science, Vol. 17, pp. 300-301. 55. Hensoldt, H. (1889) Lecture: Echinoderms, and what they teach us, February 1, Journal of the New York Microscopical Society, Vol. 5, p. 79. 56. Hensoldt, H. (1889) Lecture: Natural History in Elementary Schools, November 18, Journal of the Franklin Institute, Vol. 129, pp. 17-35. 57. Journal of the New York Microscopical Society (1890) Meeting of December 19, “Dr. H. Hensoldt remarked upon the subject of the Foraminifera, reviewing the interesting geological side of the subject”, Vol. 7, p. 94. 58. The Naturalists’ Directory (1890) Entry 2067: Hensoldt, H., Ph.D., School of Mines, Columbia College, New York, N. Y. Microscopical structure of Meteorites and petrographical philosophy in general. Collects and exchanges Meteorites esp. Stone-Meteorites, Sections of minerals and rocks. Interesting rock materials wanted, S.E. Cassino, Boston, p. 73. 59. Worstell, Mary V. (1891) My microscope, St. Nicholas, part 2, pp. 546-553. 60. Transactions of the New York Academy of Sciences (1886) Meeting of October 25, Vol. 5, p. 35. 61. American Monthly Microscopical Journal (1887) Letter to the Editor from F.J. Emmerlich, Vol. 8, p. 17. 62. Annual Register of Officers and Students, Columbia University (1890) “School of Mines … H. Hensoldt, Ph.D. 197 Hendrix St., East New York … Assistant in Natural History”, p. 29. 64. Officers and Graduates of Columbia College (1881) “(appointed) 1888 … Hensoldt, PhD, (Natural History) retired from Columbia College … 1891 Retired”, p. 71. 65. Journal of the New York Microscopical Society (1891) April 17, 1891 Annual Reception exhibits … “96. Foot of Emerald Spider, Micromata smaragdula, by H. Hensoldt” and “97. Feathers of Brazilian Humming-bird: by H. Hensoldt”, Vol. 7, p. 124. 66. Birth record of Heinrich Waldemar Hensoldt (1892) April 25, information provided by Kathy DeFay. 67. U.S.A. arrival records of the ship “City of New York” (1892) Liverpool to New York City, arrived October 6. 68. The American Naturalist (1891) Scientific news, Vol. 25, p. 594. 69. Luquer, Lea McI. (1892) Methods of modern petrography, The School of Mines Quarterly, Vol. 13, pp. 357-364. 70. U.S.A. arrival records of the ship “New York” (1893) Southampton to New York City, arrived October 7. 71. England arrival records of the ship “City of New York” (1893) New York City to Southampton, arrived November 8. 72. Census of U.S.A. (1900) Heinrich Hensoldt and Augusta Chormann Hensoldt reported to having been married for 7 years, as of July 12, 1900. 73. Census of England (1911) Rochester, Kent, household of Eliza Henderson. 74. Hensoldt, Heinrich (1890) The Naja-Kallu or Cobra Stone, Harper’s Magazine, Vol. 80, pp. 536-540. 75. The Academy (1877) Dr. Paul Goldschmidt, Vol. 11, p. 579. 76. Hensoldt, Heinrich (1893) Among the adepts of Serinagur, The Arena, Vol. 9, pp. 203-215, 328-347. 77. Hensoldt, Heinrich (1893) The wonders of Hindoo magic, The Arena, Vol. 9, pp. 46-60. 78. Hensoldt, Heinrich (1893) The secret doctrine of the Brahmins, The Arena, Vol. 9, pp. 447-459. 79. Hensoldt, Heinrich (1894) Occult science in Thibet, The Arena, Vol. 10, pp. 181-191, 366-378, 648-661. 80. Hensoldt, Heinrich (1895) The fate of Major Roger: A Buddhist mystery of Ceylon, The Arena, Vol. 11, pp. 77-78. 81. The Open Court (1906) Review of Annie Besant, eine wunderliche Heilige, by Heinrich Hensoldt, Vol. 20, pp. 254-255. 82. Khandalavala, N.D. (1906) Dr. Heinrich Hensoldt’s nightmare, The Theosophis, Vol. 27, pp. 537-542. 84. The Bookseller and Newsman (1894) The December Arena, Vol. 11, p. 19. 85. The Popular Science Monthly (1895) Publications received: Hensoldt, Heinrich. Prospectus of Popular Lectures on Oriental Travel. Vol. 47, p. 14. 86. Stead, William T. (1895) A mystery of Ceylon, a sequel: the mystery of Dr. Hensoldt, Borderland, Vol. 2, pp. 168-169. 87. Chicago Tribune (1894) Hensoldt to his critics, December 6. 88. Kersey, J.A. (1894) Ethics of Literature, E.L. Goldthwait, Marion, Indiana, USA. 89. Census of New Jersey (1895) Warren County, Oxford Township, household of Henry Hensoldt. 90. Denver Public Library Colorado Marriages 1858-1939 (accessed 2013) http://digital.denverlibrary.org/cdm/compoundobject/collection/p16079coll37/id/13079/rec/1. 91. San Francisco Chronicle (1908) Lived Dr. Jekyll and Mr. Hyde life, May 18, p. 2. 92. Census of U.S.A. (1910) San Luis Obispo, California, Household of Antonie Schulze. 93. Census of U.S.A. (1900) Scottsville, Albemarle County, Virginia, Household of Henry Hensoldt. 94. Post Office London County Suburbs Directory (1907) Hensoldt, Heinrich, Ph.D.
95. U.S.A. arrival records of the ship “Adriatic” (1908) Southampton to New York City, arrived October 29. 96. National Library of Australia Catalogue on-line (accessed January, 2013) Orient and Occident, http://catalogue.nla.gov.au/Record/249767. 97. The Star (Christchurch, N.Z.) (1907) Review of Orient and Occident, April 23, p. 1. 98. Sands Directories: Sydney and New South Wales, Australia (1908) “Hensoldt, Dr. H., publisher Orient and Occidental Magazine, Royal chambers, 3 Castleroagh st., p.r. Woodcourt st., Marrickville”, p. 978. 99. The Theosophical Quarterly (1908) Review of Breaking the Fetters; or, The Truth About the "Church," by Dr. Henry Hensoldt, Vol. 6, p. 393. 100. Sydney Morning Herald (1908) “Hensoldt-Wythes -January 15, 1908, at Holy Trinity Church, by Rev. D'Arcy Irvine, Henry Hensoldt, Ph.D., to Ada Florence, daughter of the late Thomas Wythes, of Hillend, N.S.W.”, May 2, p. 12. 101. Marriage record of Henry Hensoldt and Ada F. Wythes (1908) Sydney, New South Wales, Registration number 185. 102. Hodge, Alfred Harold (1965) The Hill End Story: A History of the Hill End-Tambaroora Goldfield, Vol. 1, Hill End Publications, Sydney, p. 99. 103. Sydney Morning Herald (1897) Report on the death of Thomas Wythes, Dec. 24, p. 5. 104. Ada Florence Wythes genealogical record (accessed January, 2013) http://graememoad.com/Family2/PS139/PS139_350.HTM. 105. 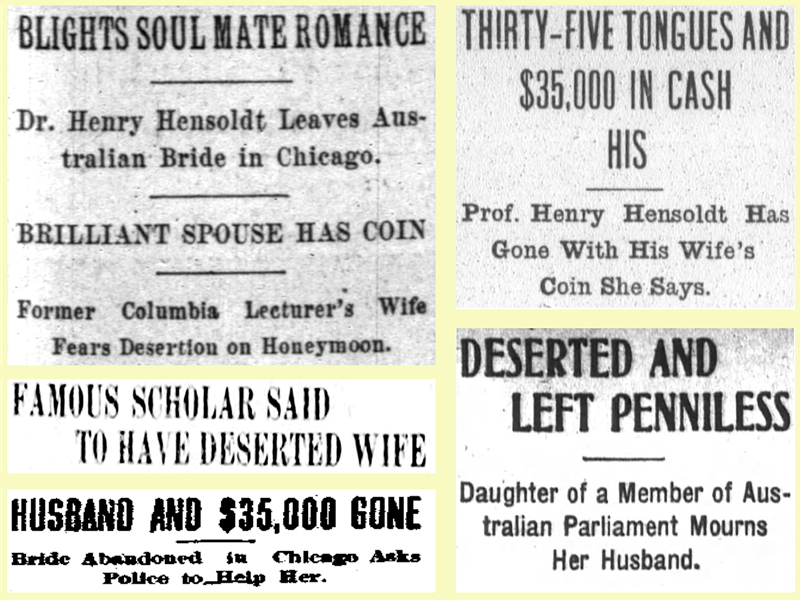 Chicago Tribune (1908) Blights soul mate romance – Dr. Henry Hensoldt leaves Australian bride in Chicago, March 14, p. 4. 106. Chicago Tribune (1908) Lecturer’s deserted bride may seek employment here, March 15, p. 2. 107. Fort Wayne (Indiana) Sentinel (1908) Thirty-five tongues and $35,000 in cash his, March 13, p. 5. 108. San Francisco Chronicle (1908) Deserted and left penniless, March 14, p. 2. 109. Salt Lake Tribune (Salt Lake City, Utah) (1908) Famous scholar said to have deserted wife, March 14, front page. 110. Democrat (Auburn, New York) (1908) Husband and $35,000 gone, March 14, p. 5. 111. Chicago Tribune (1908) Prof. Hensoldt trick miner?, March 18, p. 6. 112. U.S.A. arrival records of the ship “Evangeline” (1948) Seven day round trip from New York City, including stop in Bermuda, returned October 7. 113. U.S.A. arrival records of the ship “Bremen” (1934) Bremen, Germany to New York City, arrived October 15. 114. Washington, D.C. city directory (1937) “Bo                                                                                                                                                                                                                                                                                                                                                   erhnsen Augusta H. (wid Paul) r301 Tenn. Av. N.E.”, p. 65. 115. Census of U.S.A. (1930) Washington, D.C., 301 Tennessee Ave., Household of Johanna and Augusta Börnsen. 116. Census of U.S.A. (1920) Washington, D.C., 301 Tennes        see Ave., Household of Johanna and Augusta Börnsen and Marie Chormann. 117. Census of U.S.A. (1910) Prince George’s, Maryland, Household of Paul Börnsen. 118. U.S.A. arrival records of the ship “Adriatic” (1912) Liverpool, En       gland to New York City, arrived September 21. 119. Maryland Historical Trust Maryland Inventory of Historical Properties Form (accessed 2013) Graves-Keleher House. 120.Radium in the Light of Recent Discovery, 3rd edition, P. Börnsen, 301 Tennessee Ave, Washington, D.C.
121. Balboa Park history, notes from the Richard Amero Collection (accessed 2013) http://www.sandiegohistory.org/amero/notes-1916b.htm. 122.Washington Post (1916) “Dr. Paul Born             sen, a cousin of the great Norwegian poet, novelist and dramatist Bjornstjerne Bjornson, will address the Washington Secular League at its meeting at the Pythian Temple Sunday afternoon, his subject being “Radium in the Light of Recent Discovery”, October 14, p. 12. 123.Washington Herald (1917) Says radio-strontium will banish old age, April 6, p. 6. 124. Washington, D.C. city directory (1918) “Bornsen Paul, phys, h 301 Tenn av ne”. 125. FBI Reports (1917) Report from Agent J.E. Elliot on investigations of 301 Tennessee Ave. and interview with neighbour Mrs. E.C. Elliot, dated April 6. 126. FBI Reports (1917) Report from Agent J.E. Elliot on interview with Dr. Harvey, dated April 13. 127. FBI Reports (1917) Letter to the Dept. of Justice, probably from Dr. Harvey, dated April 4. 128. FBI Reports (1917) Report from Agent J.E. Elliot on investigations of                       301 Tennessee Ave. and interview with neighbour Mrs. E.C. Elliot, dated April 6. 129. FBI Reports (1917) Report from Agent J.E. Elliot on interview with Dr. Harvey, dated April 14. 130. FBI Reports (1917) Letter to John E. Laskey, United States Attorney, regarding suspicions of “Professor Paul Bornsen … defrauding persons by falsely representing that he was giving them radium treatments, when the material used was in fact some phosphorescent chemical”, dated May 4. 131. FBI Reports (1917) Letter to the Dept. of Justice from Anne Watson of New York City, dated July 23. 132. FBI Reports (1917) Report from Agent G.W. Lillard regarding interview with Post Office Inspector Major Little and discussing the letter from Anne Watson, dated July 26. 133. FBI Reports (Little, consisting of a letter written to Little by Mrs. M.L.H. Lang, of Waverly, New York, and a letter written to Mrs. Lang by Paul Bornsen, dated July 27. 134. FBI Reports (1917) Report from Agent J.F. Kropidlowski regarding interview with room clerk and assistant manager of the Martinique Hotel, New York City, including information that Bornsen “had been a guest last winter at various intervals”, “that several people came to him for medical treatment” and future plans “to have this office notified when (Bornsen) registers so that a cover can be placed on his telephone calls as well as an examination made of his effects”, dated August 7. 135. Washington Post (1916) Report on the marriage of Eunice James Ritter to Capt. Karl Offer, August 29. 136. Washington Times (1917) Washingtonian’s Invention Utilized by German Spies, Night Final Edition, July 24, 12. 137. Washington Post (1918) “Large front room for 1 or 2; French spoken; $25 per month; one block from 13th and D st. ne. car line. 301 Tennessee ave. ne.” September 22. 138. Washington, D.C. city directory (1919) “Bornsen Johanna H Libr Congr h301 Tenn av ne”. 139. Australia arrival records of the ship “Marama” (1908) Vancouver, British Columbia to Sydney, arrived May 20. 140. Sydney Morning Herald (1913) “At 69 Macleay-Street. Beautifully Furnished Flats, with 2 or more rooms (size 20 x 22) and kitchen. Terms from £2 10s. ROOMS (with breakfast if desired) at mod. terms. Mrs. Hensoldt. Tel., 637 William-street”, August 19, p. 4. 141. Death record of Heinrich Waldemar Hensoldt (1896) June 25, information provided by Kathy DeFay. 142. U.S.A. arrival records of the ship “Conte Biancamano” (1927) Naples, Italy to New York City, arrived October 7. 143. Kenya Gazette (1928) Probate notice of the Estate of Mrs. Prudence Hensoldt, September 18, p. 1373. 144. U.S.A. arrival records of the ship “American Farmer” (1926) Plymouth, England to New York City, arrived August 1. 145. Census of U.S.A. (1940) Washington, D.C., 301 Tennessee Ave.
146. Washington Times (1917) Dr. Bornsen to lecture, March 10, p. 10. 147. Washington Times (1917) Pain man’s normal state, March 12, p. 10.